Sites of Japan’s Meiji Industrial Revolution: Iron and Steel, Shipbuilding and Coal Mining (明治日本の産業革命遺産 製鉄・鉄鋼、造船、石炭産業, Meiji nihon no sangyōkakumei isan: seitetsu, tekkō, zōsen, sekitan sangyō) are a group of historic sites that played an important part in the industrialization of Japan in the Bakumatsu and Meiji periods, and are part of the industrial heritage of Japan. In 2009 the monuments were submitted jointly for inscription on the UNESCO World Heritage List under criteria ii, iii, and iv. The sites were accepted at the 39th UNESCO World Heritage session. The inclusion of some of these properties as UNESCO Heritage sites faced concerns and objections from Korea, due to the fact that conscripted Korean civilians and Chinese prisoners-of-war were forced to work under harsh conditions at seven of these sites during Japan's World War II mobilization policies. Recent academic research has questioned the Japanese government's compliance with UNESCO regulations and requirements with respect to the Hashima site. ^ "Sites of Japan's Meiji Industrial Revolution: Iron and Steel, Shipbuilding and Coal Mining". UNESCO. Retrieved 5 July 2015. ^ "To be World Heritage: Updated Situation". Kyuyama. Retrieved 17 February 2012. ^ a b c d "Emergence of Industrial Japan: Kyushu - Yamaguchi" (PDF). Kyuyama. Retrieved 17 February 2012. ^ "Hagi Reverberatory Furnace". Kyuyama. Archived from the original on 16 October 2013. Retrieved 17 February 2012. ^ "萩反射炉". Agency for Cultural Affairs. Archived from the original on 31 July 2012. Retrieved 17 February 2012. ^ a b "Ebisugahana shipyard & Ohitayama-Tatara iron smelting works". Kyuyama. Archived from the original on 16 October 2013. Retrieved 17 February 2012. ^ "大板山たたら製鉄遺跡". Yamaguchi Prefecture. Archived from the original on 10 September 2012. Retrieved 17 February 2012. ^ "The Shokasonjuku Academy". Kyuyama. Archived from the original on 16 October 2013. Retrieved 17 February 2012. ^ "松下村塾". Agency for Cultural Affairs. Archived from the original on 22 July 2012. Retrieved 17 February 2012. ^ "Hagi Castle Town". Kyuyama. Archived from the original on 16 October 2013. Retrieved 17 February 2012. ^ "萩城城下町". Agency for Cultural Affairs. Archived from the original on 20 July 2012. Retrieved 17 February 2012. ^ a b "Former Shūseikan and machine factory". Kyuyama. Archived from the original on 16 October 2013. Retrieved 17 February 2012. ^ "旧集成館". Agency for Cultural Affairs. Archived from the original on 21 July 2012. Retrieved 17 February 2012. ^ "旧集成館機械工場". Agency for Cultural Affairs. Archived from the original on 21 July 2012. Retrieved 17 February 2012. ^ "Former Kagoshima Spinning Engineer's Residence". Kyuyama. Archived from the original on 16 October 2013. Retrieved 17 February 2012. ^ "旧鹿児島紡績所技師館". Agency for Cultural Affairs. Archived from the original on 2 August 2012. Retrieved 17 February 2012. ^ "Gionnosu Battery". Kyuyama. Archived from the original on 19 May 2015. Retrieved 17 February 2012. ^ "祇園之洲砲台跡". Kagoshima City. Retrieved 17 February 2012. ^ "Mietsu naval facility site". Kyuyama. Archived from the original on 14 October 2013. Retrieved 17 February 2012. ^ "Hashino Iron Mining and Smelting Site". Kyuyama. Archived from the original on 16 October 2013. Retrieved 17 February 2012. ^ "橋野高炉跡". Agency for Cultural Affairs. Archived from the original on 22 July 2012. Retrieved 17 February 2012. ^ "Site of Kosuge ship repair dock". Kyuyama. Retrieved 17 February 2012. ^ "小菅修船場跡". Agency for Cultural Affairs. Archived from the original on 1 August 2012. Retrieved 17 February 2012. ^ "Hokkei well shaft, Takashima coal mine". Kyuyama. Archived from the original on 25 January 2015. Retrieved 17 February 2012. ^ a b "北渓井坑跡". Nagasaki City. Archived from the original on 19 December 2012. Retrieved 17 February 2012. ^ "Hashima coal mine". Kyuyama. Archived from the original on 16 October 2013. Retrieved 17 February 2012. ^ "Former Glover House". Kyuyama. Archived from the original on 16 October 2013. Retrieved 17 February 2012. ^ "旧グラバー住宅(長崎県長崎市南山手町)". Agency for Cultural Affairs. Archived from the original on 21 July 2012. Retrieved 17 February 2012. ^ "三菱重工業長崎造船所ハンマーヘッド型起重機". Agency for Cultural Affairs. Archived from the original on 21 July 2012. Retrieved 17 February 2012. ^ "Maeda Battery". 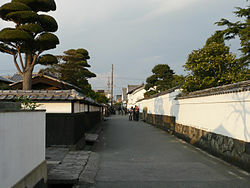 Kyuyama. Retrieved 17 February 2012. ^ "Miyanohara Pit, Miike coal mine". Kyuyama. Archived from the original on 16 October 2013. Retrieved 17 February 2012. ^ "三井石炭鉱業株式会社三池炭鉱宮原坑施設". Agency for Cultural Affairs. Archived from the original on 20 July 2012. Retrieved 17 February 2012. ^ "Miike Port and Coal Mine Industrial Railway". Kyuyama. Archived from the original on 16 October 2013. Retrieved 17 February 2012. ^ "Misumi West Port". Kyuyama. Archived from the original on 16 October 2013. Retrieved 17 February 2012. ^ "三角旧港（三角西港）施設". Agency for Cultural Affairs. Archived from the original on 4 September 2012. Retrieved 17 February 2012. ^ "The State-owned Yawata Steel Works". Kyuyama. Archived from the original on 16 October 2013. Retrieved 17 February 2012. ^ "Sites of Japan's Meiji Industrial Revolution: Iron and Steel, Shipbuilding and Coal Mining". UNESCO. Retrieved 21 October 2015.